In this image, we take you to the destination of Sandals Grande Antigua Resort and Spa! This was an amazing and memorable photo session and wedding. Jaclyn and Darryl had their actual wedding on August 26th, 2016. Both ceremony and reception were held at the Lockport Locks in Lockport, NY. Here they exchanged their vows in front of family and friends and danced the night away. 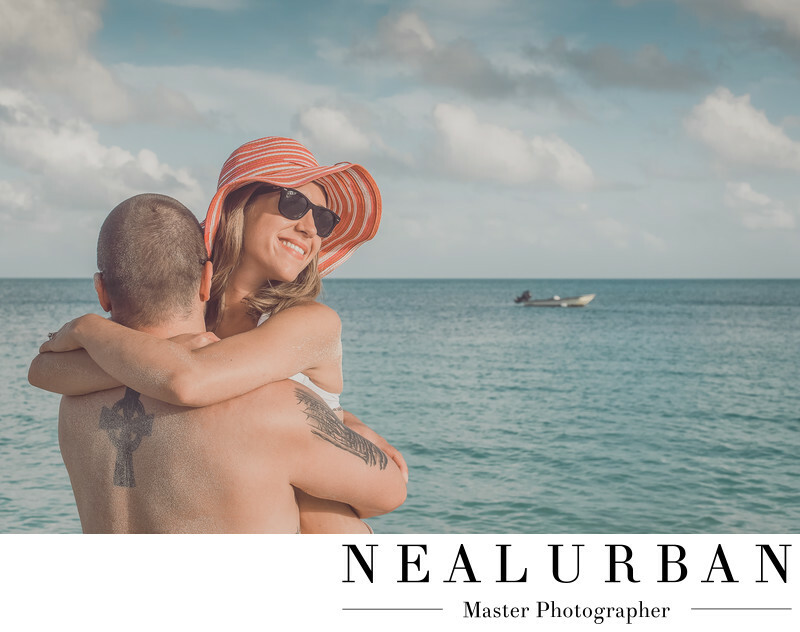 When they first met with us at Neal Urban Studio, they wanted us to come on their honeymoon to Antigua because they loved our artistic style of photos. We put together a wedding package that would include their wedding back home and 4 days of photo shoots in Antigua. We didn't want take over their entire honeymoon, but didn't want them to lose out on what we could do for them. We had a few meetings to all get on the same page and discuss the shoots we would be doing those days we would be there. We honestly could say, it worked out perfect! We did so many different looks with them. We did not take up their whole day either. We could do some photos at sunrise, then catch them before going out to dinner for sunset or night photos! We got to photograph them the first night at a beach party having a great time with other guests and the staff! They even won a contest held by the party crew! We all had so much fun and captured some great photos. We did schedule a wedding attire day. Jaclyn had hair and make up done and we did a normal style wedding day session! We just did it in a few hour time span! Then it was beach day. That is what you see here! This is mine and Jaclyn's favorite image! I know you can not see her husbands face, but look at her expression. And that beach hat! There is a random boat in the ocean. The water was crystal clear. We could not ask for a better back drop. We could not ask for a better couple either! They were up for anything and completely trusted our ideas and judgment! After all was done, they ended up with two amazing albums, and two sets of wall art prints for their new home they built! This photo made an entire two page spread in one of their albums. I know I say they had two albums. We offer so many styles of albums. They chose one of our signature style albums to showcase the artistic images from both parts of the wedding. Then they did a basic album to tell the entire timeframe of events! We know we have so many more memorable moments to capture for this family!